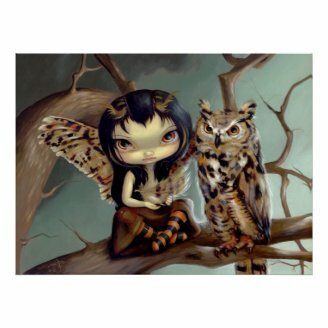 Jasmine Becket-Griffith calls her art "Strangeling" and it fits. She paints beautiful girls and fairies, who are often accompanied by other creatures. And her creations, whether human, animal, or mythical, all have the most amazing eyes. She has created a whole series of fairies with "dragonlings," yes little dragons like the one here. Of course I love them all! There are "Owlyns" too - little fairies that seem to be part owl. Of course they live with the owls, which naturally have the big eyes. 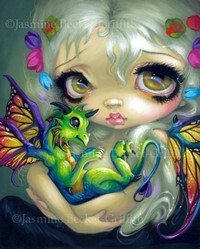 Image of "Darling Dragonling IV" ©Jasmine Becket-Griffith from www.Strangeling.com. 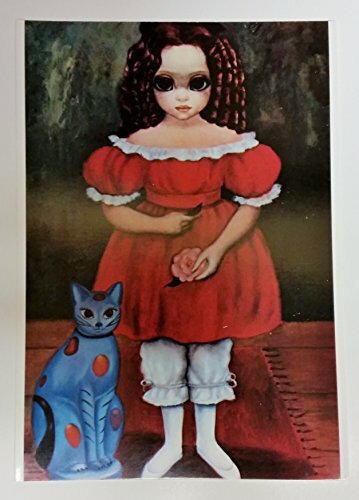 Jasmine Becket-Griffith is certainly not the only artist to paint big eyes, nor is she the first.The original "Big Eye" artist is Margaret Keane, known as the "mother of big-eye art," who began painting this style in the 1960s. She was soon famous for her paintings of "sad-eyed waifs" - cute children with enormous eyes. Her husband, Walter, marketed them as mass-produced prints and they became a commercial success, with several other artists copying the style. Unfortunately, though, Walter then claimed he was the artist - what a jerk. No wonder Margaret's early works are sad! Margaret divorced him, moved to Hawaii, became a Jehovah's Witness, and won the rights to all her paintings. Her later paintings still have big eyes but are so much happier. Fine art by Margaret Keane is available as greeting cards, double matted cards, posters and refrigerator magnets at Keane Look. 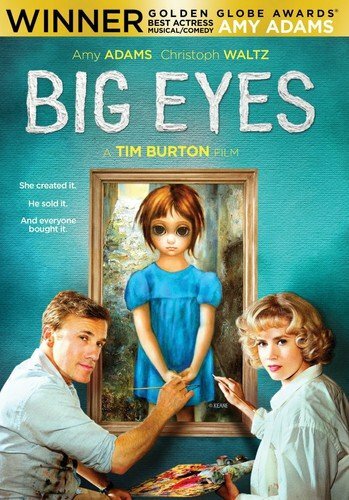 Tim Burton's movie "Big Eyes"
In recent years there has been a revival of Big Eye art. Some new artists have taken up the style, but with a difference - they added fantasy. That means dragons, fairies, and other mythical beings have come to the land of big eyes! 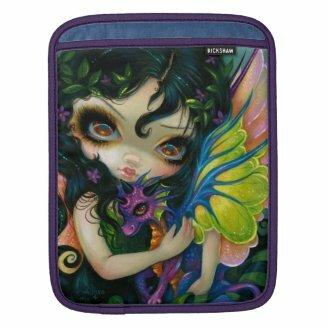 Two of these artists are Blonde Blythe and Jasmine Becket-Griffith. Both of them have some amazing artworks, and they publish books too. This article is about Jasmine's "Strangeling" art, but I'll get to Blonde Blythe next. 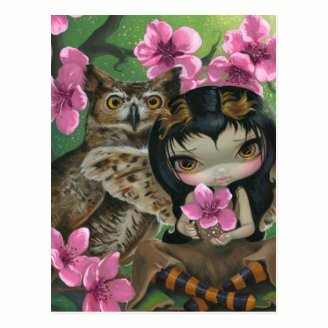 Jasmine Becket-Griffith is a freelance American artist, born in 1979, who lives in Florida with her husband and several cats. She loves animals (yes, she has those three cats and paints them as well as lots of other animals), reading (fantasy of course among a variety of other genres), and would you believe she actually has big eyes! Jasmine paints with acrylic on wood or canvas, and paints all the time. The only time she is not painting is when she is attending conventions and shows. So she has quite a large portfolio! Her husband and other family members help with the business of selling her art, and her designs appear on several brands. Her Big Eye art is certainly popular. 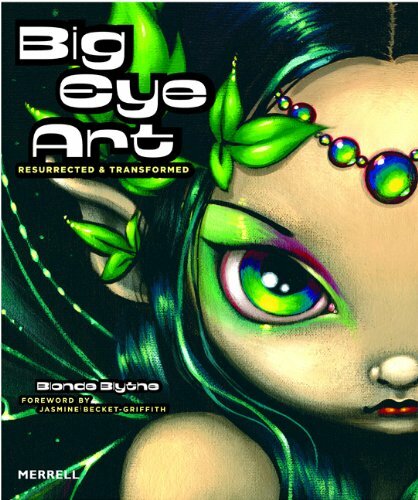 But really it wasn't the big eye girls, or fairies like Owlyn, that sold me on Jasmine's art. It was the dragonlings! 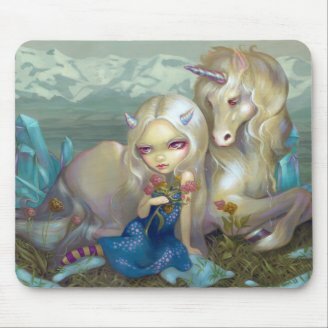 Now, as a fan of dragons I'm always looking at dragons in art (not so many in everyday life you know), and when I found these adorable dragonlings I was truly sold. 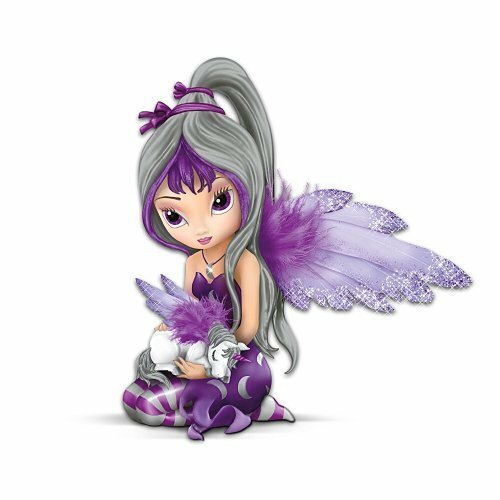 The dragonlings are really cute, little, baby dragons, often held in the arms of a big eye fairy whose wings and coloring usually bear a striking resemblance to their little dragonling. Dragonlings are not limited to being friends of fairies, though, there is a wondrous golden dragonling who seems to live with a mermaid! Strangelings are not just found as works of art on canvases and posters, or even just reproduced in books. They can be found in many other forms. 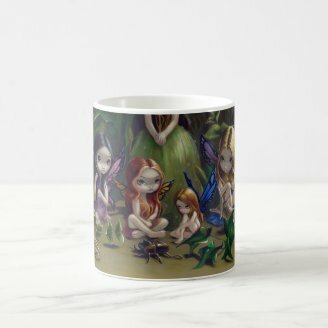 There are figurines available through the Bradford Exchange and Hamilton Collection;products like mugs, mousepads, cases and sleeves for electronics, and much more on Zazzle; and her sister Amber and brother-in-law Chris sell jewelry featuring her work at their eBay store, Strangeling Art Emporium. Strangelings have been made into the cutest figurines! 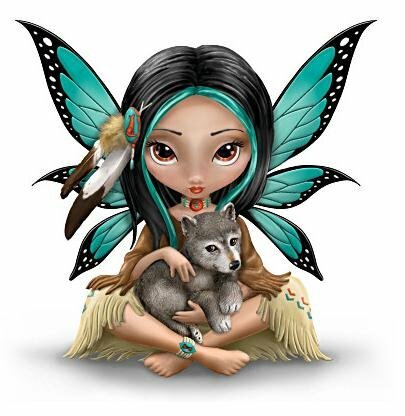 You can learn all about Jasmine Becket-Griffith and her art on her website, Strangeling. What do you think of Strangeling art? Your welcome - and thanks for your appreciation. I love that golden dragon too - it is kind of fawn-like! jptanabe, The Golden Dragon reminds me of a fawn in its pose and in the outline of its head and upper body; it is simply adorable. The figures and the use of color are enchanting. Wow Beautiful art work! Big eyes are beautiful! Another excellent Wizzle. You work magic with your presentations of wonderful artists. I shared this via Pinterest. Oh yes, she has an angel with a gorgeous nautilus shell that is wonderful. I do enjoy Strangeling's art. She has an image of a big eyed character with a nautilus shell which is one of my favorites.